This is a beautiful 100% silk dress from Armani Collezioni. Which is one of Georgio Armani's brands. 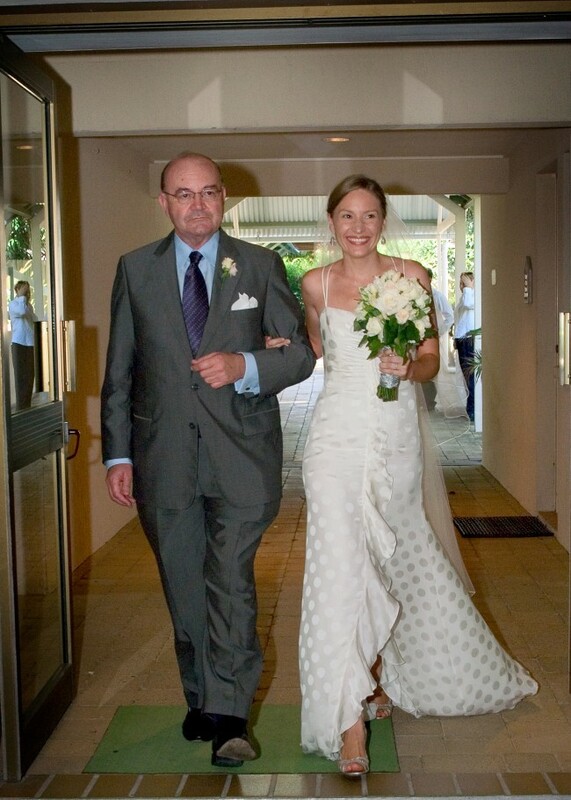 The dress was purchased at Harrods in London in 2005 and was worn only once, on my wedding day. It is an extremely flattering dress, with ruffled skirt that flows when you walk, spaghetti straps which cross over on the low back, and a bow at the top of the ruched sweetheart neckline. The fabric has subtle polka dots, which give it a point of interest, whilst remaining very elegant and sophisticated. There is a button and loop in the lining allowing you to bustle the skirt should you choose too. This is a stunning and timeless, classic dress and I'm sad to let it go, but it is time for it to find new a proud owner. I have a beautiful, long simple veil and hair slides available too. In the lining at the bottom of the dress there is a tiny hole, and there are a couple of faint watermarks at the bottom, but these are only visible if you search for them, however I feel it is important to declare these flaws.